The very first kid who made it to the Blind Audition is Kyle Bernido from Cagayan de Oro. Kyle at an early age of 13 has a really good voice. She is a total performer since she can dance, sing and play musical instruments. Aside from singing, she is also fond of playing sports and this concludes that she is sporty type. Kyle was discovered during their Foundation Day. She had a performance that time and when she finished performing, she was about to step down of the stage when suddenly a red envelope was handed to her mother. She read it and she knew that she was one of the chosen kids who will audition for The Voice Kids. Looking at her life story, she didn’t know since childhood about the identity of her real parents. Her grandmother and grandfather were the parents who were introduced to her. 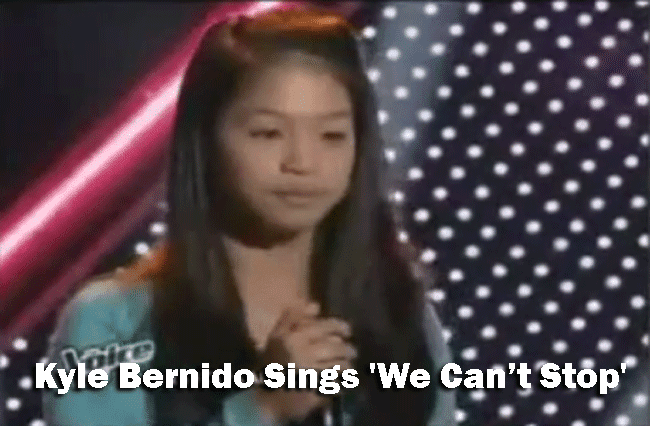 She joined The Voice Kids in order to show her talents and though she felt a little nervous, she was determined to perform “Can’t Stop” that made the three coaches turn their chairs. It was Sarah who first turned then Bamboo and lastly, Lea. The three coaches convinced Kyle to join them and it was a tough decision for Kyle since the three have turned their chairs. The unexpected joining on the contest of Kyle Bernido led her to this kind of opportunity and in the end it was Sarah who won her heart. Kyle is about to undergo training with her chosen coach.